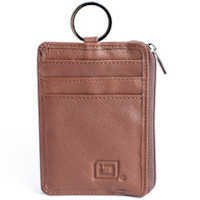 This slim leather key ring wallet has 3 card slots on one side, an ID window on the other, and a zippered compartment. Everything about this wallet is RFID shielded and protects from electronic pickpocketing. It starts out ultra-thin, but can expand as you add multiple cards. Perfect for a front shirt or pants pocket or a compact purse. 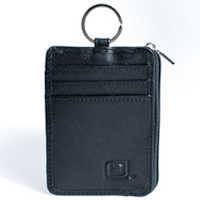 The Mini Wallet with Key Ring is loaded with the same RFID protection and great features as the Mini Wallet AND is now fitted with a key ring making it the perfect multi-credential wallet/badgeholder. It can either be carried in the pocket or purse, or conveniently hung on a lanyard. This mini wallet is the perfect answer to protect your badges and cards. Both men and women love this wallet! Each individual pocket is completely shielded, locking your personal information safely inside. Thanks to this smart design, even when your wallet is wide open, each card is protected. 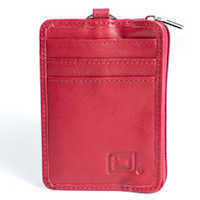 This RFID blocking leather wallet has a Secure by Design Police Approval Specification for Identity Fraud Protection.